Growth of the energy drink industry has continued to grow over the years, gaining in popularity since the rise of Red Bull, which is currently the world’s leading energy drink. Many people don’t realize the the dangers of consuming these drinks on a regular basis, or are unphased by the effects that they may have on a person’s body. Along with the increase in demand, the drinks have increased in size, largely containing two to three servings in one container,and the concerns over long term effects have developed alongside, raising concerns about the use of potentially harmful combinations of beverages. In about 5 years, from 2005 to 2010 the consumption of energy drinks by the average American more than doubled, from .5 gallons to 1.2 gallons per year. Just since 2009 there have been 90 filings received by the FDA with reports of heart attacks, convulsions, a spontaneous abortion, and a handful or two of deaths related to energy drinks, with more than 13,000 people being sent to the emergency room due to consumption of these drinks. These drinks provide levels of caffeine that are considered unsafe, which is a concern for the FDA. For comparison, these drinks contain about 4 or 5 times as much caffeine as the average soda. Due to labeling laws, these companies are not legally obligated to display the amounts of caffeine, or may choose to only show partially what is in the beverage. 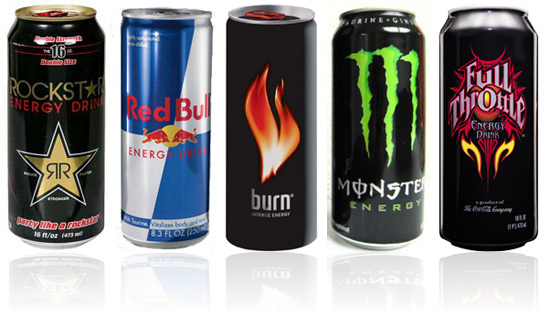 Other risks of consuming energy drinks are heart palpitations, seizures, strokes and sudden death. These risks become increasingly higher with the levels consumed, and should be monitored more closely, or avoided altogether.